If purchasing or renting from companies other than Pearson, the access codes for the MyLab™ Education with Enhanced Pearson eText may not be included, may be incorrect, or may be previously redeemed. Check with the seller before completing your purchase. For courses in Inclusion or Introduction to Special Education. This package includes MyLab Education with Enhanced Pearson eText andthe loose-leaf version. Research-based classroom and content strategies for the inclusive classroom. 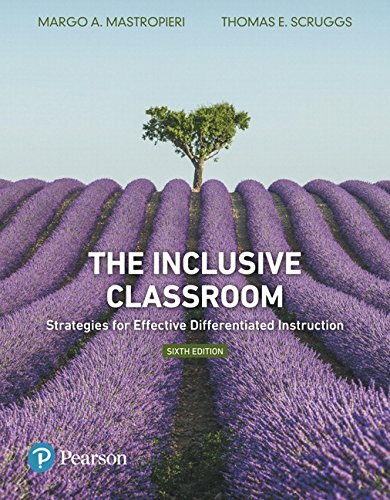 The Inclusive Classroom: Strategies for Effective Differentiated Instruction , Sixth Edition captures the best of inclusion practices. Using a non-categorical approach, Mastropieri and Scruggs explain the fundamentals of inclusive teaching, the most effective general teaching practices, and ways to differentiate instruction for specific content areas. Targeted teaching strategies show ways to improve all students’ memory, attention, motivation, study skills, and peer interaction.Research Highlights features validate strategies and demonstrate why particular techniques are best practice. Filled with classroom-ready tips and checklists, this revision includes an expanded chapter on Response to Intervention (RTI) and Multi-Tiered Systems of Support (MTSS), more coverage of the Common Core StateStandards (CCSS) and Universal Design for Learning (UDL), and the latest strategies relating to academic success. MyLab Educationis an online homework, tutorial, and assessment program designed to work with the text to engage students and improve results. Within its structured environment, students see key concepts demonstrated through real classroom video footage, practice what they learn, test their understanding, and receive feedback to guide their learning and ensure they master key learning outcomes.